February 15 is National Gumdrops Day. These chewy candies have fallen out of fashion in favor of gummy worms and bears, but they are still popular with bakers. 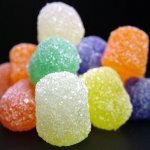 Gumdrops are sugar coated gelatin candies, that may have different flavors. Many believe that these candies were invented by Percy Trusdale in 1801, but there is no much evidence to support this claim. The earliest American printed reference of gumdrops is an advertisement from Illinois State Chronicle in 1859, but the invention of these candies can predate by decades or even much longer. The first gumdrops were flavored with spices and had different colors: orange for cloves, yellow for allspice, red for cinnamon, green for spearmint, purple for anise, white for peppermint and black for licorice. Today gumdrops also have fruit flavors. Grape, orange, cherry and lemon flavors are the most popular. Gumdrops are out of fashion. Gummy bears and gummy worms became more popular, than original gumdrops. Anyway they are widely used by bakers for garnishing cupcakes and cakes. And where would gingerbread house be without its gumdrop decor?